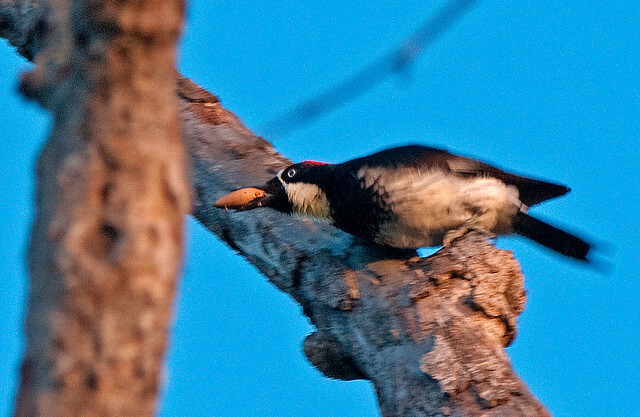 The Acorn Woodpecker is named after its diet of acorns. These birds utilize a communal granary or acorn tree to store or cache their live oak acorns from season to season. Being skillful at drilling holes is one of their gifts. Their “social networking” group tends to the acorns, moving them to the right size holes as the acorns dry out and shrink. Another job is to protect and defend their cache from robbers like the Western Scrub Jays. 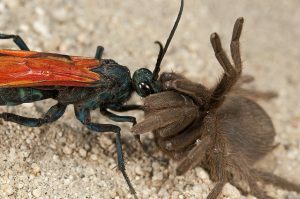 They stick together as their shared survival depends on their granary’s fortunes. Acorn Woodpeckers communicate to their tribe with loud raucous “ rachet-rachet-rachet“ calls that sound like laughing to us humans. 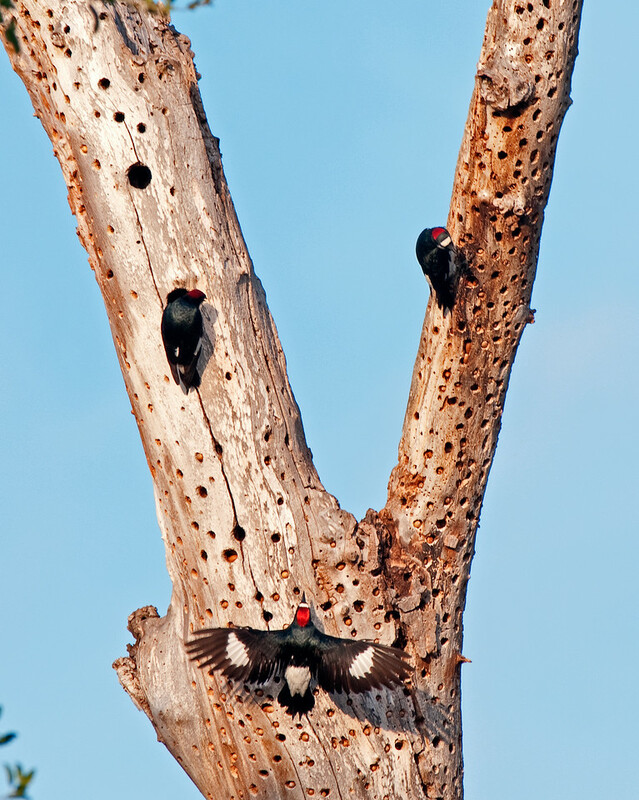 Also, they are noted for their “drumming” which is a woodpecker’s way of communicating with the group. Drumming consists of 2-20 evenly spaced taps and is often executed on specific drumming posts, typically dead limbs with good resonance. Drumming is associated with intra-specific territorial encounters and as a method to attract mates. 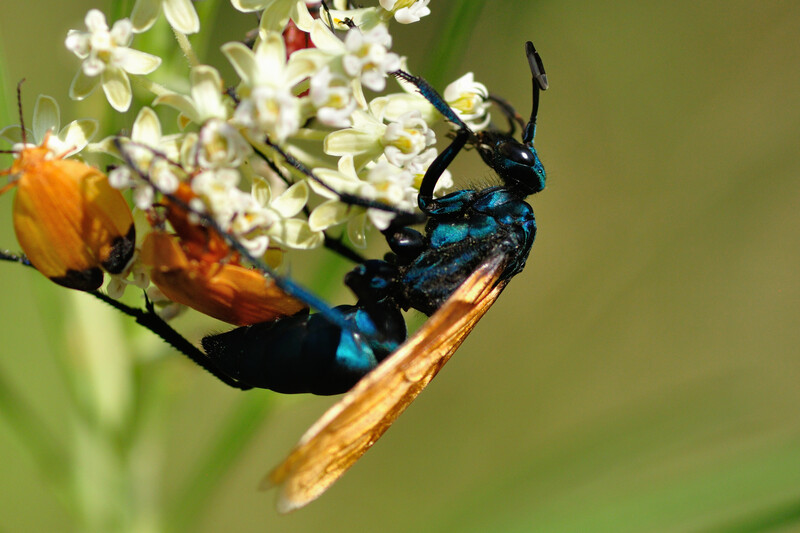 Drumming is done by both sexes and may occur at any time of the year but is most common in spring. ( Koening, 1996) Drumming is also done on telephone poles, buildings and other man-made structures that provide good resonance…often to the dismay of their human neighbors! Male Acorn Woodpecker showing full wing span as he lands at the granary. Look closely at their head colors. The Males sport a large red cap starting at the forehead with white toward the front. Females sport a smaller red cap with some black toward the top and white in front. 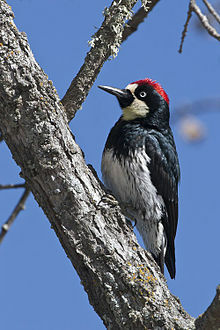 Male Acorn Woodpecker at the granary in Los Penasquitos Preserve. Spring 2010. When you get to feast your eyes on one, you may agree that they look a bit like Woody the Woodpecker who was partly based on their comical facial plumage. This article was written by Jeanie Anderson and published in this newsletter.